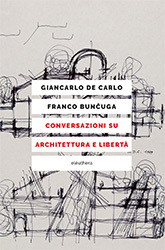 As one of the bigger protagonists of the Italian architectural and urbanistic scene, in these deep convesations Giancarlo De Carlo (1919-2005) speaks us with passion and competence about his non-hierarchical idea of space, an idea he has put into practice through the projects he has realized inside and outside Italy. Moreover, he gives shape to that «attempted» approach, as he himself defines it, that has allowed him to deconstruct all those dogmatic languages and burocratic regulations which often curb the urban planning. A friend and a supporter of many of those intellectuals stranger to all the dogmatic approaches of the second half of the Nineties – Elio Vittorini, Italo Calvino, Vittorio Sereni, Cesare Pavese among others – De Carlo has been the first one to experiment partecipation as a preminent element in urban planning, that means the attention for the freedom of choice of citizens and, as a consequence, for the requests coming «from below», which has today become an important part of the more aware urban planning programs. Franco Bunčuga (Brescia 1949), after having studied as an architect in Venice with Giancarlo De Carlo, in the Eighties he has been professor at the Ecole Politechnique d'Architecture et d'Urbanisme of Algeri. Now back to Brescia, he currently teaches Art History in high school.